This weekend Alex and I had a few friends come to stay. I love to cook and wanted to make something delicious, but I did not want to slave away in the kitchen all afternoon in order to prepare dinner. Lasagna sounded good. It is easy enough to make, and if you use no-boil noodles, there is very little prep time required of you. So lasagna it was. My friend Michelle whipped up a Jello No Bake Strawberry Cheesecake while I assembled the lasagna. Michelle and I ran to the grocery store to get the ingredients we needed, while the guys watched the kids and the results of the SC primary. Things were running smoothly, by my calculations, dinner would be ready just in time for the little girls to fill their bellies before heading off to bed. 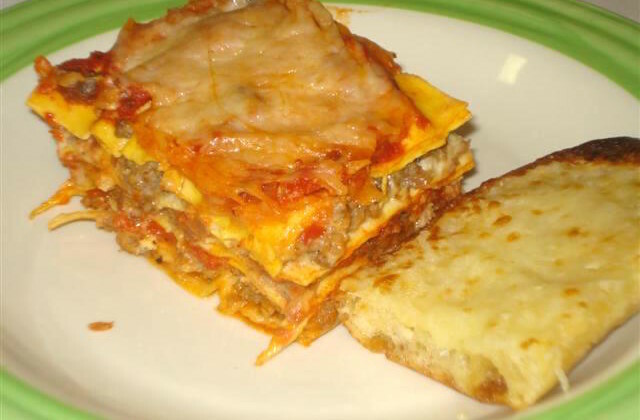 I had browned my meat and was beginning to assemble my lasagna when I realized that I only had FOUR lasagna noodles. FOUR. That was it. So I quickly made the girls peanut butter sandwiches (sorry girls!) and ran back to the store to get more noodles. Things didn’t go according to plan, but everything turned out perfectly in the end. While the lasagna was cooking; Michelle and I gave the girls a bath and put them in bed. This allowed the adults to have dinner in peace and quiet. It was a great weekend. Good food, good friends and a great time. Brown beef and sausage in olive oil, until cooked through. Make sure to break meat apart while cooking. Drain off excess fat once meat is cooked through. Combine egg, ricotta, 2c mozzarella, Parmesan cheese and salt/pepper together. Grease a 9x13 in. pan. Pour 1c sauce on bottom. Layer 4 lasagna noodles on bottom. Put 1/3 cheese mixture down on top of noodles. Next place 1/3 meat mixture, followed by 1/2c mozzarella cheese. Cover with 1-1 1/2 c sauce. Repeat process twice. Once you get to the last layer, place 4 lasagna noodles on top, cover with the last of the sauce, followed by last of the mozzarella cheese. Cover and bake for 45-50 minutes. Uncover and bake for 10 more minutes. Allow to cool for 10 minutes before slicing into it.